Prawn, Pepper and Avocado Salad is a scrumptious treat that can be served either as a main dish or simply a starter to lunches and dinners. This wonderful salad provides you with amazing blend of prawns and avocados and will have you asking for more. With just under a few key ingredients, this dish is trouble-free to prepare. It is enough for four servings but make adjustment in the quantity of the ingredients keeping your number of guests or family members in mind. First of all, rinse the mixed salad leaves and arrange them in a large serving platter, placing them around the corner. Now, scatter the wedges of hard boiled eggs on the top of the avocados. Place the six cooked cold prawns in a medium bowl and top them with fresh lemon juice and olive oil. Add in salt and grounded black pepper to taste. Toss all the ingredients in the bowl to coat them thoroughly. 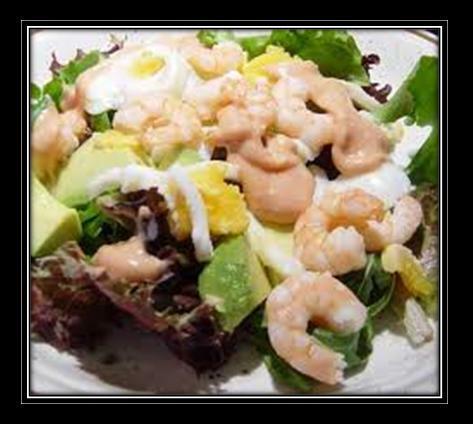 Pour the prawn-mixture on top of the avocados and set the plate aside until you make the dressing for the salad. Add mayonnaise, ketchup, Worcestershire sauce, Tabasco sauce, and fresh lemon juice to a medium mixing bowl and mix them properly. Your salad’s dressing is read; drizzle it all over the salad in the plate and serve immediately.